Good Morning Everyone. It’s Monday December 19th and that means there are only 6 days until Christmas Day. Christmas can definitely be an expensive time of the year and if we get carried away in the spirit of gift giving we can definitely break our budget. Green Panda is here to help everyone save some money during the holiday season and start some new (inexpensive) holiday traditions. Today in our “Home for Holidays” series we are discussing different ways that we can save money during the holiday season with some inexpensive (and maybe some new) holiday traditions. Ask Everyone To Bring Something. It is very expensive to host a holiday party. It is also very time consuming to plan and prepare a holiday dinner. It is a lot easier and definitely more budget friendly to ask our guests to prepare and bring a dish. Don’t Serve Dinner. We can host a party with a buffet style menu that serves hors d’oeuvres and snacks. We can invite people over after lunch around 2 pm or we can start our party after dinner around 7 pm. This will ensure that people have eaten before they come over. We will have more time for gift giving and socializing with our friends and family when we don’t have to sit down at the table for dinner. Get Outside. The holidays are about spending time with family, so dress warmly and get outside to spend time with your family and enjoy the winter weather. 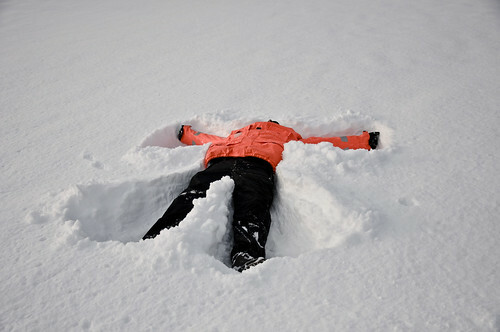 You and your family can make Snow Angels, Build a Snowman, or go Ice Skating. Outdoor activities keep us active and let us get some fresh air. When we party inside during the holidays we sit and watch TV, eat food, and drink. Getting outside is definitely a healthier and more active way to spend time with our family members during the holidays. Go To The Movies. If you celebrate Christmas on another day of the year (i.e. December 24th or January 7th) or if you find yourselves with nothing to do after the gifts are exchanged and the presents are opened on December 25th then go to the movies. I personally love going to the movies, and the last two years I have gone to the movies on Christmas Day with my friends after our family holiday parties were finished. I was surprised to see how many families spend the holidays together at the movies. There are always some great movies that come out during the holiday season so what better time to see a great movie than on Christmas Day. Tell us about your family holiday traditions. Do you drink hot chocolate in front of the Fireplace? Do you exchange gifts on Christmas Eve? Do you sing Christmas Carols with your neighbours? How do you and your family celebrate your holiday traditions?